Germany's full service carrier Lufthansa Airlines plans to operate an Airbus 380 on India route from winter this year, a senior airlines official said. Lufthansa received its first Airbus 380 (out of the total 15 on order) which it plans to operate on its Johannesburg route. "We are looking forward to operating the aircraft into India during the winter schedule," Lufthansa German Airlines' director, South Asia, Axel Hilgers, told reporters on Wednesday. During the handover ceremony in Hamburg, Lufthansa unveiled its new First Class cabin with eight generous seats on the upper deck. 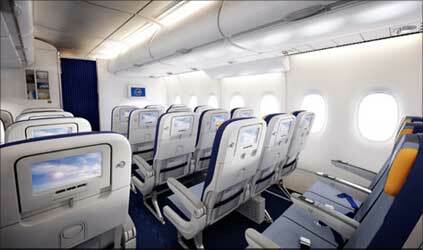 The upper deck is also equipped with 98 Business seats while the spacious main deck hosts 420 Economy Class seats offering a unique feeling of comfort and space. 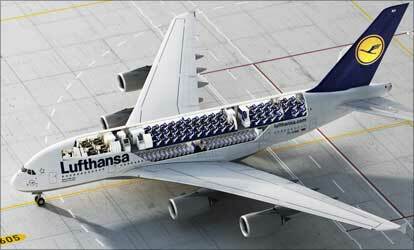 Lufthansa's A380s are powered by Rolls-Royce Trent 900 engines. The airline's winter schedule in India starts from October 29 and lasts up to March every year. "Maybe, we are not 100 per cent ready to fly on November 1. But I hope we fly in the winter schedule. It may be January or February...," Hilgers said. The deployment, however, is subject to regulatory approvals and New Delhi Airport's preparedness to operate such a big aircraft, he said. The developers of New Delhi Airport, GMR, is constructing a new terminal, Terminal 3, which would enable an Airbus 380 operate from there and it is expected to be operational from July this year. Hilgers said Lufthansa was in the process of applying for regulatory approvals. 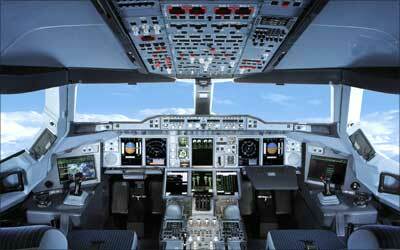 "I do not see any major problem in getting DGCA's approval." Under the bilateral agreement between India and Germany, the air carrier is allowed to fly 69 flights per week. However, it now operates only 49 flights per week. "So capacity-wise, it (getting approval) should not be a problem." Lufthansa would be taking delivery of 4 Airbus 380 this year and plans to operate on Tokyo, Johannesburg, and Beijing sectors, using Airbus 380 aircraft, he said. 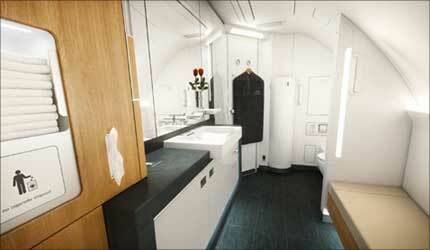 Image: The First Class rest room. 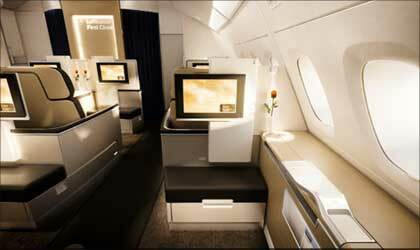 The A380 has unmatched fuel efficiency, consuming less than three litres per 100 kilometres per passenger. Thanks to excellent aerodynamic performance, the A380 complies with strictest noise limits, which makes it the quietest large aircraft flying today. The all new double deck aircraft generates only half as much noise on take-off and landing as the previous largest passenger aircraft. The A380 also provides vital extra passenger capacity without increasing the number of flights, and is therefore part of the solution for sustainable growth at congested airports. 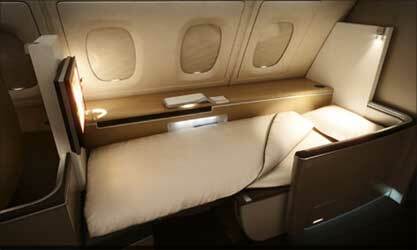 Image: Bed in the First Class cabin. 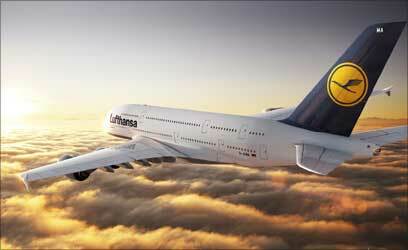 Lufthansa becomes the fifth airline to introduce the A380 into service. Wednesday's delivery marks the 28th Airbus A380 to be operating with the global route network of leading airlines. The current A380 fleet already connects 21 important international routes on five continents. Seventeen major international airports are regular A380 destinations.